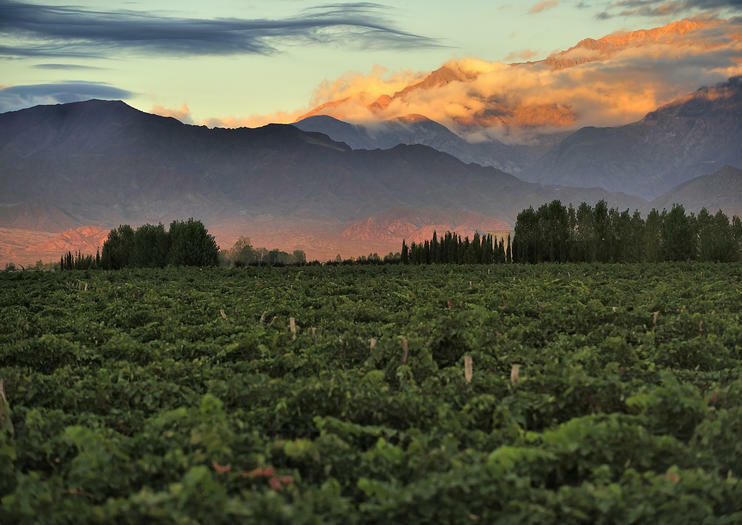 Known as the Napa Valley of Argentina, Mendoza is Latin America’s largest wine-making region with more than 800 wineries. Uco Valley in particular is known for its malbecs, cabernet sauvignons, syrahs and ruby red tempranillos, which benefit from 250 sunny days a year, very little rain, fertile soil and a cool micro-climate where the average temperature is 57 degrees F.
An hour’s drive southwest of the city of Mendoza, Uco Valley is a popular destination for travelers on the Argentina Wine Route. As well as producing the highest altitude (900-1,200 meters) wines in the province, the valley is renowned for its beauty. Covering 45 miles by 15 miles on the eastern slopes of the Andes, Uco Valley follows the northern course of the Tunuyan river as it flows down from the surrounding snow-capped peaks. As you visit the valley’s vineyards, looks out for almond trees and orchards too. If you’d like to stay overnight, the main town in Uco Valley is Tunuyan. To get to the valley, you can either drive from the city of Mendoza (one hour), or alternatively, many Argentina Wine Route tours include stops at Uco Valley’s renowned vineyards. Explore the southern part of the Mendoza Province, known for its lush green landscape, on this 10-hour tour from Mendoza city. Visit highlights such as the Wax Museum, San Rafael, the 25 de Mayo Village, Nihuil Dam & Reservoir, and the Uco Valley. Round-trip transport from most Mendoza city hotels provided. Whatever your requirement, we will tailor make a tour just for you!Stroll amongst the vinyards and enjoy the landscapes with their rows of vines. Stop for a few hours and explore the greatest wineries, offering a unique opportunity to learn more about how wine is made, from grape harvest to bottling.A wide variety of half-day trips are available, the perfect format for a first foray into the region.These trips offer an opportunity to explore the vines of Uco Valley, Luján de Cuyo or Maipú through tastings and themed tours focusing on wines, arts and the architecture of the wineries.As a closing tour we will have lunch at of the prestigious restaurants located near by. Enjoy this unique visit to Mendoza´s agricultural valley, to know more about wines of the Uco Valley. Tour Mendoza's wineries and choose your favourite Argentinian Malbec This 4-day Mendoza Wine Tour features the vineyards of Mendoza and includes guided visits to the traditional wineries to sample the rich Malbec and Cabernet. Located at the base of the Andes Mountains and nearby Mount Aconcagua, Mendoza is known for its year-round sunshine, gourmet restaurants and delicious wines. With boutique hotels as well as comfortable budget accommodation available, the Mendoza Wine Experience Tour offers something for everyone. Full day tour in Uco Valley (9 am to 6 pm) On this tour, we visit three premium wineries in this up-and-coming region, which has a touch of glamor. The large and charming Uco valley is known for its view of the Plata mountain range, a dominant feature of the snow-capped Andes to the west. The wineries and vineyards are at an altitude of around 1200–1600 meters (3940–5200 feet) above sea level. This region is best known for robust wines, innovative architecture, and top-level cuisine and lodging.